Americans are aging. So what is their greatest concern? Surprisingly, it is not loss of memory, cancer, heart disease, amputation, loss of speech or hearing. According to a study from Johns Hopkins,1 it is the loss of vision. 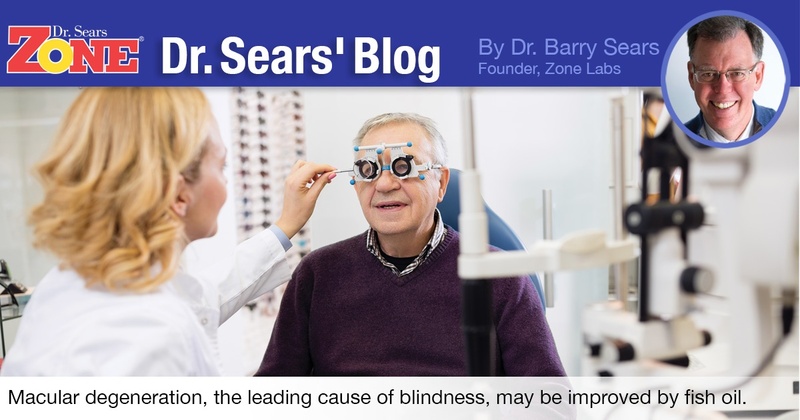 The reason being that losing sight has the greatest negative impact on daily lives leading to loss of independence. However, more than half of the respondents didn’t know anything about macular degeneration, which is the leading cause of blindness after age 50. There are two types of macular degeneration: wet and dry. Only 10% of the population has wet macular degeneration. At least the wet form of macular degeneration can sometimes be controlled (but not improved) by monthly injections of a monoclonal antibody into the eye at a cost of around $4,000 per injection. However, 90% of macular degeneration falls into the dry category for which there is no known drug treatment. This means once you get dry macular degeneration, you will eventually go blind—unless you take action. Lowering the AA/EPA ratio has such a profound impact in dry macular degeneration because it is an inflammatory disease. Once you reduce inflammation in the eye (specifically in the retina), the problem begins to resolve. So, if you are aging and concerned by potential loss of vision, you can start your own vision recovery program today. Just make sure the fish oil is incredibly pure. OmegaRx 2 is the only product that meets that criteria, as its standards for upper limits of toxins such as PCBs are 10 times more rigid than a prescription fish oil product, and 18 times more rigid than a typical fish oil in a health food store or a supermarket. Take enough OmegaRx 2 so that your AA/EPA ratio, measured by the Cellular Inflammation Test, is reduced to about 2. Of course, the day you stop taking OmegaRx 2, inflammation in the retina will begin to rise again. So, what are the long-term side effects of taking OmegaRx 2 for a lifetime? You will be happier and smarter. I only wish more drugs would have side effects like those. Scott A et al. “Public attitudes about eye and vision health.” JAMA Ophthalmol 134: 1111-1118 (2016). Georgiou T et al. “Pilot study for treating dry age-related macular degeneration with high-dose omega-3 fatty acids. PharmaNutrition 2:8-11 (2014). Georgiou T and Prokopiou E. “The new era of omega-3 fatty acid supplementation: therapeutic effects of dry age-related macular degeneration.” J Stem Cell 10: 205-215 (2015). Souied EH et al. “Omega-3 fatty acids and age-related macular degeneration.” Ophthalmic Res. 55:62-69 (2015).